WASHINGTON, D.C. — As four mothers and their babies visit Capitol Hill to tell lawmakers how pregnancy centers changed their lives for the better Thursday, Jan. 18, they’ll also have the opportunity to hear directly from U.S. Senator Joni Ernst, at Heartbeat International’s 16th Babies Go to Congress. A Republican from Iowa, Sen. Ernst spoke at the 2016 and 2017 March for Life and is a key sponsor of the Pain-Capable Unborn Child Protection Act—which ends most abortions at 20 weeks and beyond and is expected to go before the Senate the week of this year’s March for Life, Jan. 19. Each of the four mothers participating in Babies Go to Congress overcame significant challenges to choose life in the midst of an unexpected pregnancy, thanks to the help of a locally funded and operated pregnancy center affiliated with Heartbeat International. An event abortion industry leader Planned Parenthood would never dream of pulling off, Babies Go to Congress has brought 155 mothers and their children into congressional offices since Heartbeat International took its initial group to the nation’s Capitol in 2009. 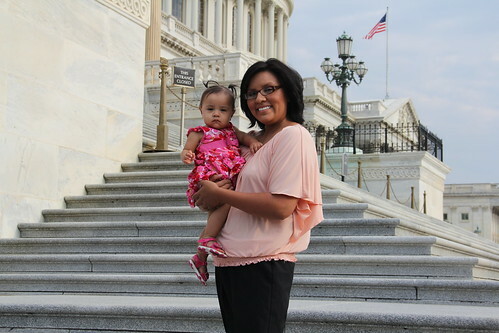 Overall, mothers with their children in tow have visited 315 congressional offices representing 25 states. This year’s group is made up of mothers and children from North Carolina, Ohio, Missouri and Florida. One of the mothers, Kelsey Hedges from Missouri, refused abortion when the father of her twin girls pressured her to end their lives in the womb. Thursday, Jan. 18, Hedges and her 15-month-old daughters will tell their story to the Senate offices of Republican Roy Blunt and Democrat Claire McCaskill, as well as the House offices of Republicans Blaine Luetkemeyer and Jason Smith. Click here to learn more about the 2018 Babies Go to Congress participants and follow their journey to Capitol Hill. "This is one event Planned Parenthood could never dream of pulling off." COLUMBUS, OHIO – In what it hails as the most powerful pro-life event on Capitol Hill, Heartbeat International is bringing seven mothers—and their children—to Washington, D.C. this January to tell elected officials how they chose life with the help of a community-funded pregnancy center. The event, “Babies Go to Congress,” takes place Jan. 26, the morning prior to the annual March for Life, and is Heartbeat International’s 15th such visit to the nation’s capitol since 2009. In the previous trips, 113 mothers and their children have visited a total of 265 offices—including those of both Democrats and Republicans. In each visit, a mother who has rejected abortion with the help of a pregnancy help organization has the opportunity to tell her story, alongside both her child and the staff from the center that helped her choose life. The group this year is made up of two mothers from Ohio, as well as one each from North Carolina, Missouri, Arizona, Texas and Wyoming. Though six of the mothers are bringing with them children 4 years old and younger, one mother—Nikki Pinkley from Branson, Mo.—is bringing her 14-year-old daughter to the event. Together, Nikki and her daughter, Alexis, illustrate the positive life-long impact of that nation’s 2,600 pregnancy help centers. Nikki was raised in the church and had recently graduated high school when she found out she was pregnant. Finding help at Options Pregnancy Clinic in Branson, she not only chose life for Alexis, but the staff at Options encouraged her to keep pursuing her education and career goals. Today, Nikki is a closing in on a decade as a licensed professional counselor and is working on her doctoral degree in psychology. Heartbeat International is the first network of pro-life pregnancy help organizations founded in the U.S. (1971), and the largest network in the world. With 2,100 affiliated pregnancy help locations—including pregnancy help medical clinics (with ultrasound), resource centers, maternity homes, and adoption agencies—Heartbeat serves on all six inhabited continents to provide alternatives to abortion. For more information, see www.HeartbeatInternational.org. WASHINGTON, D.C. – A little child shall lead them. This well-loved statement will get plenty of airtime this Christmas season, but the phrase may end up becoming the theme of Heartbeat International's Babies Go to Congress® when the most powerful prolife effort on Capitol Hill takes place January 22-23, 2015. An entourage of five former pregnancy help center clients and their children, rescued from the threat of abortion, will be highlighted by 12-year-old Christiana Pablo from Bowie Crofton Pregnancy Center in Bowie, Md., who is already blossoming into an outgoing champion for the life-affirming support offered by the more than 2,400 pregnancy help organizations rescuing 3,000 babies each week in the United States alone. Faced with an unexpected pregnancy, Christiana's mother, Victoria Chan-Pablo—only 15-years-old at the time—found the support she needed to welcome Christiana into the world at Bowie Crofton Pregnancy Center. Her eldest daughter has been joyfully repaying that debt, sparking fundraising and community-building efforts for the center, which has served over 24,500 women and families since opening its doors in 1982. "I say that Bowie Crofton Pregnancy Center saved my daughter's life because they opened up our eyes and gave us the knowledge, the strength and the encouragement to help us carry out our decision in keeping our baby," Victoria said. Christiana and Victoria will have a chance to tell their story to their elected congressional representatives, along with centers from Ohio (Pregnancy Decision Health Centers), North Carolina (LifeLine Pregnancy Help Center), Indiana (Matrix Pregnancy Resource Center), and Arizona (Living Hope Women's Center). It is the first time in the history of the program that North Carolina will be represented. Since beginning the program in 2009, a total of 109 women and children representing over 50 centers have visited 222 congressional offices from 23 different states. "It's difficult to imagine a more empowering experience for a woman than Babies Go to Congress," Peggy Hartshorn, Ph.D., President of Heartbeat International, said. "This is an event that drives to the very heart of what life-affirming work is all about: every mother feeling loved and supported, both during her pregnancy and into parenthood." Mid-term election season. The idea may strike more placid acceptance than the inspiring, engaging sense of civic involvement of a presidential election year. But, as champions of life with our citizenship in two worlds, even a mid-term election should call us to attention, action, and mobilization on behalf of our fellow countrymen—both born and pre-born. This is why we make it a priority to vote our beliefs, off-year or not. We realize lives, futures, and legacies are at stake in our communities, states, and nation. These elected officials represent not only you, but your organization's staff, volunteers, donors... and clients. In addition to your vote, your elected representatives need to know the truth. Each of them needs to hear from you and your clients—their constituents—the truth that Pregnancy Help Organizations are Good for America. When a pregnancy help organization succeeds, lives are saved. That's an undeniable reality. A beautiful reality. A miracle. Something your elected representative needs to know. That's the goal of Heartbeat's Babies Go to Congress, taking place January 20-22, 2015. It's your opportunity to sit down with your elected officials and not only tell the story of your organization's life-saving work, but—side-by-side with a client and her baby—to show the story of rescue that happens every day in organizations like yours. Since 2009, a total of 109 women and children from over 50 organizations in 22 states have visited 222 congressional offices. The babies are at it again January 20-22, 2015. Click here to find out how you and your organization can get involved. I’m excited to share with you our encouraging news “fresh from Washington, D.C.”! I spent almost a week in our nation’s capital for meetings with national pro-life leaders, for the annual March for Life, and for our Babies Go To Congress™ (BGTC) event. What a magnificent week! Click here for a quick picture album of our March for Life team. First, our BGTC was full of glory. We took several Heartbeat affiliates and their clients with babies – five Heartbeat teams totaling 27 people – to meet with to key Congressional representatives in 23 offices. We delivered the message that “pregnancy centers are good for America.” And our mothers were able to tell their stories as well and present to their elected officials a copy of the powerful report A Passion to Serve, A Vision for Life (researched by Family Research Council with the help of Heartbeat and other organizations in our movement). Walking the halls of Congress with our affiliates, mothers, and babies, was an honor and blessing for me personally. “I wanted to thank you and Heartbeat International for the love and commitment to healthy babies and families you showed to me and every lady in attendance (and the thousands of others that benefit from all that Heartbeat does). I personally praise God for you! Anthony and I experienced so much while in Washington, DC, I am still processing/taking all of it in… I am a counseling student and I will be obtaining my School Counselor Certification. After my professors heard of my pending trip and involvement in BGTC, they advised me to submit a proposal to present at this year's Illinois School Counselor Association Annual Conference… School Counselors in Chicago need to be able to "Connect the Dots" and know about community resources that their students may need. I hope that each of you will experience in 2010 the personal “refreshment” I experienced during this intensely pro-pregnancy center week, feeling the Hand of God at work in the halls of Congress and at the March for Life. Clearly, our united labor, gifts, prayers, and strategic initiatives are winning our fellow Americans over to the truth and goodness of our Cause. Learn more about BGTC at HeartbeatInternational.org. Return to Take Heart Volume 2, Issue 2. In the teeth of a bitterly cold week in Washington, D.C., Heartbeat International brought along eight moms and eight babies to deliver a single message to their elected representatives. Their message? Pregnancy help centers are good for America! This year’s entourage was the largest contingent Heartbeat has ever brought to the nation’s capitol, bringing the total number of moms and babies to over 100 throughout our 12 trips since we initiated Babies Go to Congress® in 2009. While a look at big numbers like these (plus the more than 200 congressional offices we’ve visited!) certainly provides a breath-taking view of God’s goodness, no number quite drives the point home like… Two. That’s because, every day in the pregnancy help centers, medical clinics, maternity homes, and non-profit adoption agencies Heartbeat International serves, the lives of women and their unborn children are being rescued, protected, and preserved… Two lives at a time. Take Diana and Jaycee, for example. Single and 19, Diana felt as if her “whole world stopped” as the pregnancy test read Positive. Afraid to tell her family and desperate to find a way out, abortion was a real option for Diana’s mind as she typed in the words, “pregnant and scared” into her Google search engine. What she found was a nearby Heartbeat affiliate pregnancy center whose after-hours phone number routed automatically to Option Line®, Heartbeat’s 24/7 pregnancy helpline (800-712-HELP). Patiently listening to Diana’s story, the caring voice on the other end of the line helped schedule an appointment for the following week at the pregnancy help center. I went into (the center) knowing there were other options like an abortion and thinking that was my only way out. My thoughts of having a baby were overshadowed with unanswered questions and I felt like I had hit a dead end. That day now four years behind her, Diana was all smiles as she shared her story with her Rhode Island congressional offices in Washington. Of course, she didn’t come alone, as she was joined by her 3-year-old son, Jaycee, whose life was both spared and nurtured because Diana found the emotional support and practical resources she desperately needed through Option Line and Heartbeat’s network of life-saving local partners. Like Diana, every woman facing an unexpected or difficult pregnancy desperately needs the emotional support and practical resources that only pregnancy help organizations provide. Over 100 moms and babies thank you… Two at a time. Commending the pregnancy help movement... Pregnancy Help Centers are Good for America! Every year, Heartbeat International brings moms and their children to Washington, D.C. to remind our congressmen and women that pregnancy help centers are good for America. Babies Go to Congress, held every year close to the March for Life, shows our elected officials at the federal level the amazing way lives change with the help of grassroots organizations like yours. There's no replacement for the flesh-and-blood testimonial of a mother holding her child to show lawmakers that pregnancy centers are good for america. A key piece of information Heartbeat International always hopes to underscore through the event is the privately funded, non-profit status of pregnancy help organizations. Unlike most meetings congressional offices hold with their constituents, there is never any request for public funds as part of the event, a fact that also stands in stark contrast to highly profitable, publicly funded abortion businesses like Planned Parenthood. Since beginning the program in 2009, over 100 women and children representing over 50 centers have visited over 200 congressional offices. Your center can benefit from participating in Babies Go to Congress this January. Click here for more information and take this opportunity to share during a truly historic moment in our nation's history! Over the years, pregnancy centers have been under attack by abortion advocates from Planned Parenthood, NARAL, Lady Parts Justice League, and many others. Heartbeat International is there to both officially refute the unfounded claims (through news coverage at PregnancyHelpNews.com), and to pass along needed information to affiliates through emails, conference calls, live or recorded webinars, and more. So wether it's a protest from "The Handmaids", a "glitter bomb" in the mail, or a campaign of false reviews on your organization online, Heartbeat International is always there to help affiliates respond appropriately. Shelly and daughter Kiree at the Capitol. Heartbeat’s Babies Go to Congress® puts a face on the very divisive issue of abortion, or, more precisely, what to do with an unexpected child. This July, Heartbeat International brought its tenth group of moms and babies to our nation’s capital at a critical time to speak life to power. Once again, God equipped those whom He called to Heartbeat’s Babies Go to Congress. We had four affiliates participating from California, Indiana, Oklahoma and Texas, bringing four moms, two infants, and two children. Dividing into teams, we held 14 congressional meetings in one day. July’s Capitol Hill adventure brings our total number of participants to 150 since Heartbeat’s Babies Go to Congress began in January 2009. That includes 34 affiliates from 23 states along with 86 moms and babies. We have held nearly 200 congressional meetings. The moms involved did a fantastic job of explaining how pregnancy help organization staff and volunteers cleared away obstacles so they could welcome a new little life. Each mom, in her own engaging way, explained to her elected officials that even though there was pressure to abort her baby, the pregnancy help network made it possible to embrace motherhood. One of the things that made this event unique is that we had a mom representing the Choctaw Nation. Shelly Louis of Durant, Okla., not only had the opportunity to meet with her representative, but was very well received by U.S. Representative Cole, who happens to be the only Native American congressman. Shelly also met with both of her U.S. senators. Senator Coburn even took her aside and, with his hand placed affectionately on her shoulder, thanked her for choosing life for little Kiree. Additional highlights included a meeting with Congresswoman Bachmann who shares our passion for life. Congresswoman Hartzler shared a wonderfully touching adoption story with our group. She also encouraged everyone to keep up the good work. While the most pro-abortion administration in U.S. history promotes taxpayer sponsored abortion and mandates anti-child policies – because childlessness is cheaper – every pro-life American has a heightened responsibility to clarify the importance of providing alternatives to abortion. Through Heartbeat’s Babies Go to Congress, we provide this opportunity for moms to let policy makers know that pregnancy help centers are good for America. It is our goal that U.S. lawmakers from every state understand that alternatives to abortion prevent coerced abortions. Click here to find out how you can be considered for our next trip to Washington D.C. January 23-24, 2013.